Conyza canadensis is an annual or winter annual C3 herb (Ludwig et al. 2010), roots found to be associated with mycorrhizal fungi (Weaver 2001), stem 1-1.5 m tall, hairy, unbranched below inflorescence. Conyza canadensis (horseweed) stem and leaves. © 2007 Katy Chayka. Minnesota Wildflowers. minnesotawildflowers.info (Accessed 1/018). Leaves alternate, to 8 cm long, 0.8 cm wide cm, numerous, closely spiraled around stem, reduced upwards to 0.5 cm wide, sometimes appearing opposite or whorled, hairy, tip pointed, sparsely toothed, winter rosette leaves stalked, larger than later stem leaves, dying as stem elongates. Conyza canadensis. Max Licher. SEINet. swbiodiversity.org.jpg (Accessed 12/2014). Flowers whitish, tiny, appearing to never fully open, rays 25-40, 0.1 cm long, nearly hidden by involucral bracts, disk flowers yellow-green, 60-70, in very small, numerous heads 0.3-0.5 cm wide; inflorescence long, open branched, rather diamond-shaped, flowering branches leafless. 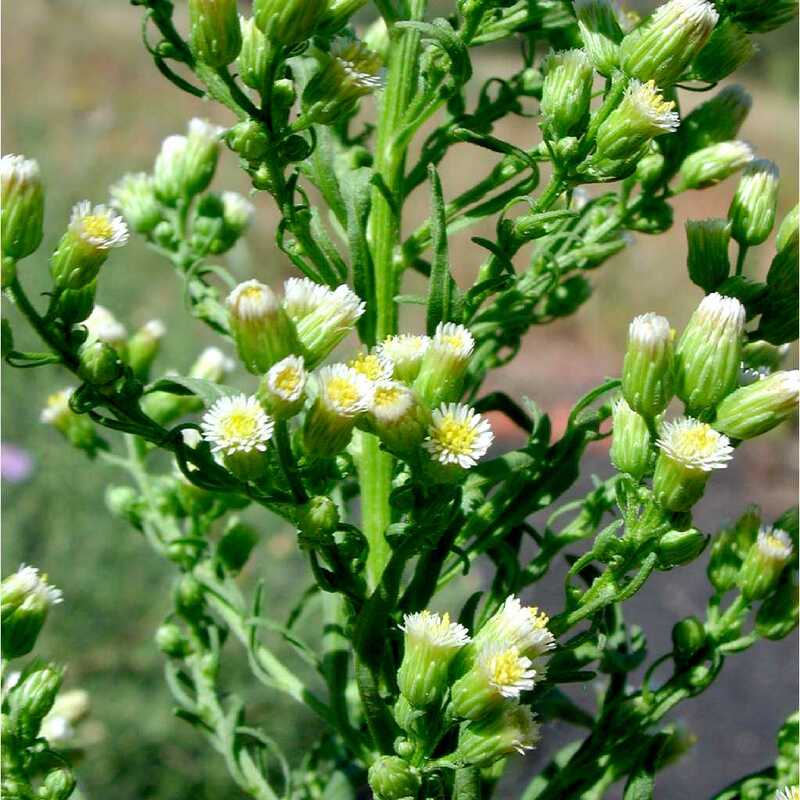 Flower stalks begin to grow in May, blooms by mid-July; primarily self-fertile (autogamous) (Mulligan and Kevan 1973) but does outcross to a small extent (Weaver 2001), July-Sept.
Conyza canadensis (horseweed) fruiting. © 2008mKaty Chayka. Minnesota Wildflowers. minnesotawildflowers.info (Accessed 1/2018). 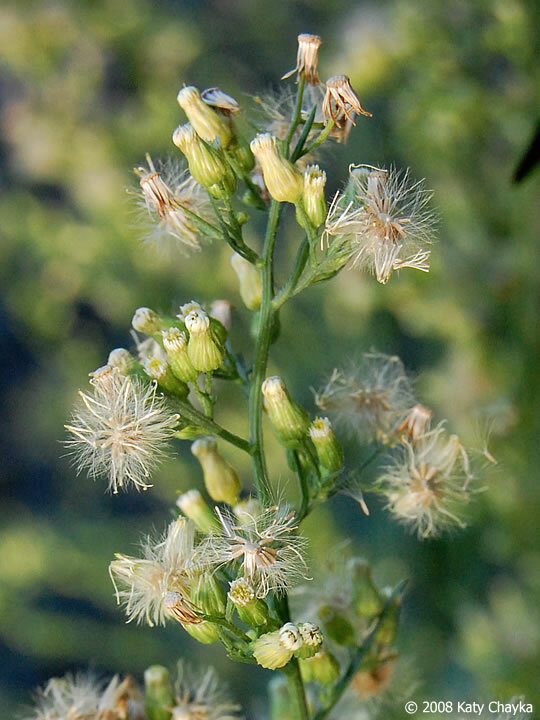 Fruit dry, 1-seeded achene to 0.2 cm long, with plume to 0.5 cm long, wind dispersed; a plant 40 cm tall may produce about 2000 seeds that germinate the same season, Aug.-Oct. 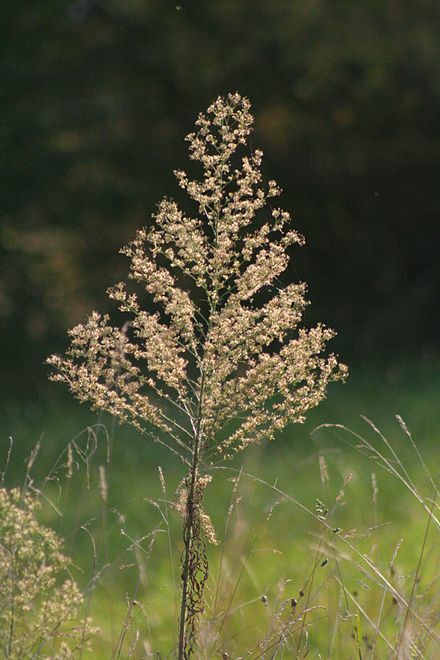 Frequency in NYC: Frequent, more common than indicated above, often growing along highways and other weedy areas. Habitat: Weed of open areas, vacant lots, fill, roadsides on open soil. 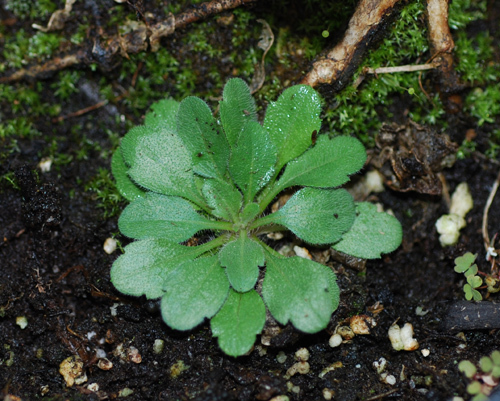 An early successional plant (see introduction). Tolerates soil pH 4.8-7.2 (USDA, NRCS 2006). germinates in spring but produce fewer seeds at maturity (Weaver 2001); light required for germination (Keever 1979). Seeds viable in soil up to 20 years. Seeds eaten by a few birds and small mammals, plants eaten by rabbits (Martin et al. 1951). Drought tolerant, requires full sun. Host of the tarnished plant bug (Lygus lineolaris, Miridae, Hemiptera) larvae eat flowers, fruit and leaves. Insect herbivores include tarnished plant bug, Lygus lineolaris, Adelphocoris lineolatus, another bug; the goldenrod gall insect Procecidochares atra, has been found on horseweed. 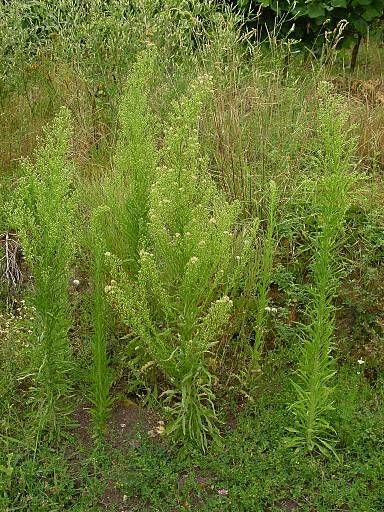 Horseweed can be infected by a number of fungi and by aster yellows, a mycoplasma transmitted by the aster leaf hopper, (Macrosteles fascifrons, Cicadellidae, Homoptera (Weaver 2001; Johnson and Lyon 1991). These are bacteria-like organisms without cell walls (Agrios 1988; Weaver 2001). Oily extracts contain numerous terpenoid compounds and have been used medicinally. 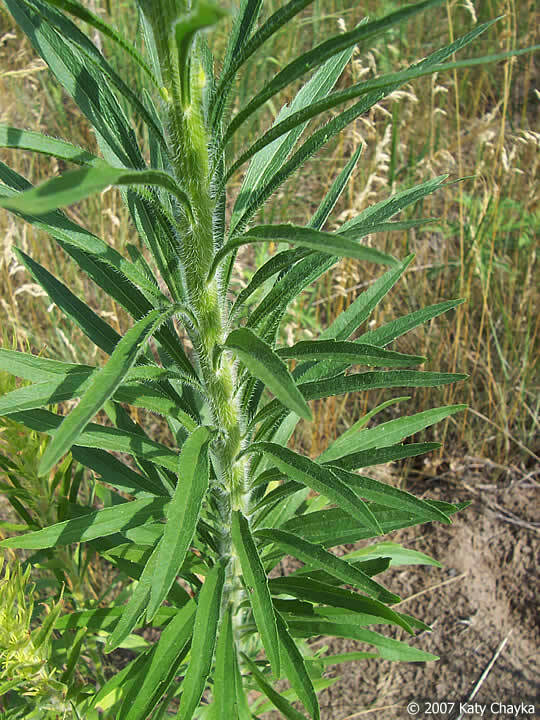 Horseweed also contains various flavonoids and tannins. It has been used to sequester cadmium in contaminated soils (Weaver 2001).